UPDATE: On 4/7/18, this recipe was updated for better results. My favorite crab cake in the whole world is was served at Cafe Atlantico in DC (rest in peace). I compare every crab cake I eat to it, and none match up. Except for this one. Cafe Atlantico’s crab cake is was very tiny and served with a refreshing green salad and grapefruit segments. The crab cake is citrusy, mustardy, and incredibly moist with a crispy sear on the outside. I set out to emulate it, and I think I succeeded. Big success! Using both dijon and whole grain mustards are key because the dijon is strong and spicy while the whole grain mustard is mild, but its grains let you know what flavor to expect. And lemon is important to provide a citrusy, refreshing zip. 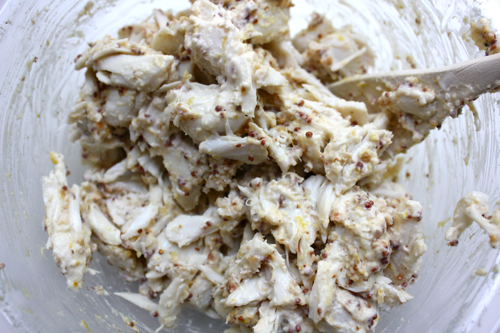 In a medium sized bowl, stir together 1 egg white, 1.5 tablespoons of mayonnaise, 1 tablespoon of dijon mustard, 2 tablespoons of grain mustard, the zest from half a lemon, and ground black pepper. Then, stir in 3 tablespoons of breadcrumbs. These ingredients are important to help bind your crab cakes, but they shouldn’t be noticeable in the finished product. I don’t find it necessary to add salt, because the mustards and crab itself tend to have enough. 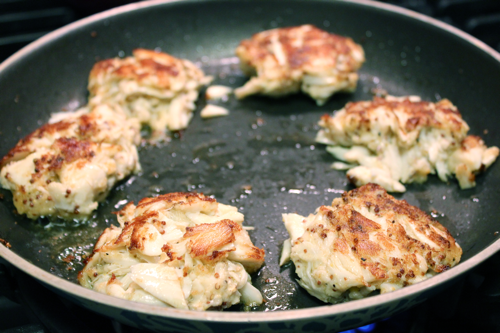 Add 16 ounces of jumbo lump crab meat into the bowl, and very gently fold everything together with a rubber spatula. If a crab cake doesn’t have big lumps of meat in it, it’s not worth eating. This recipe should yield 10 medium-sized crab cakes. Stella’s nose was going wild. It’s amazing how fragrant the crab mixture is! You can either proceed to cook your crab cakes, or you can cover the mixture with plastic wrap and let it sit in the fridge for a few hours to let the flavors infuse. When you’re ready to cook the crab cakes, heat some olive oil in a pan over medium-high heat. I really love pan-seared crab cakes because they get a toasty crust but remain very moist on the inside. My mom made delicious crab cakes this way, but she stopped doing it because she didn’t like that the oil splatters. The oil does splatter a little bit, but the taste is worth the clean up! Once the olive oil is hot, shape some of the crabmeat mixture into a patty using your hands. I found that the crab cakes stay together best if you really compress them and then place them in the pan. Once they are brown (about 2 minutes), flip them over carefully using a spatula. Don’t press down on the crab cakes with the spatula while they are cooking or else your patties will break and lumps of crabmeat will scatter. 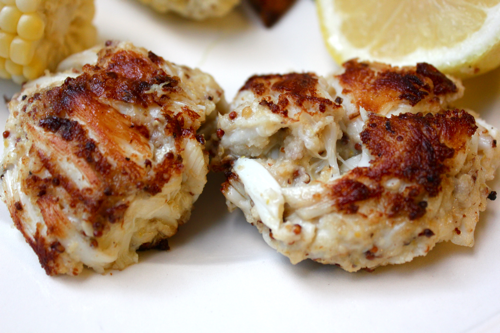 Remove your crab cakes from the pan and set them on a plate lined with paper towels to drain the excess oil. 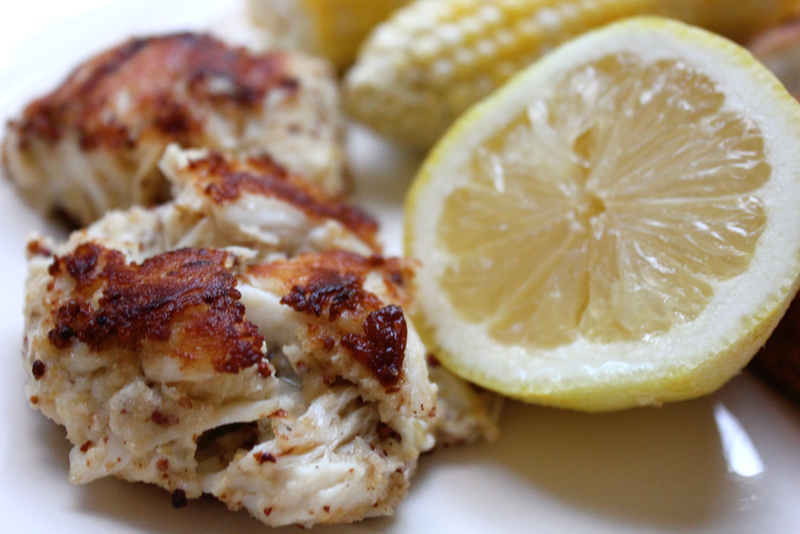 Before serving, generously drizzle the crab cakes with lemon juice. Then, enjoy breaking through their crispy exteriors to pull lumps of meat out of the moist centers. I’m ready for another serving- this is the summer of the crab, after all! I was effectively ejected from the Global Supper Club after moving to Philadelphia, but its recipes live on in my heart and my kitchen. 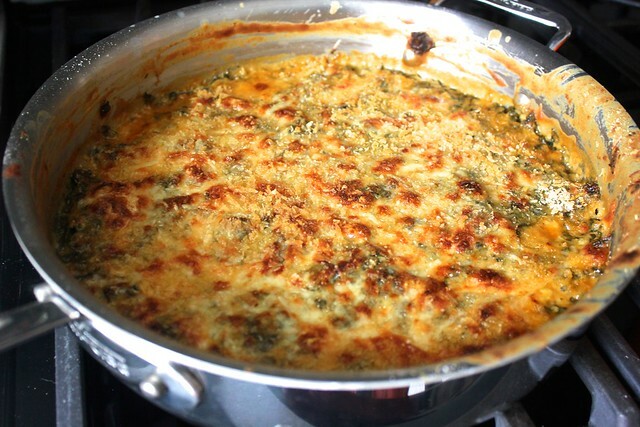 This decadent kale gratin was one of the stars when our group prepared a Friendsgiving feast, and I made it this year when I hosted my family. Yes, that means I finally got the chance to roast a whole turkey (so easy- like cooking a big chicken), but I’m not sure it’s even worth sharing a recipe for that. But this kale gratin should definitely grace tables far and wide, because smokey, cheesy greens are key to warmth and happiness. To make it, get 2 bunches of kale. Any variety will do. 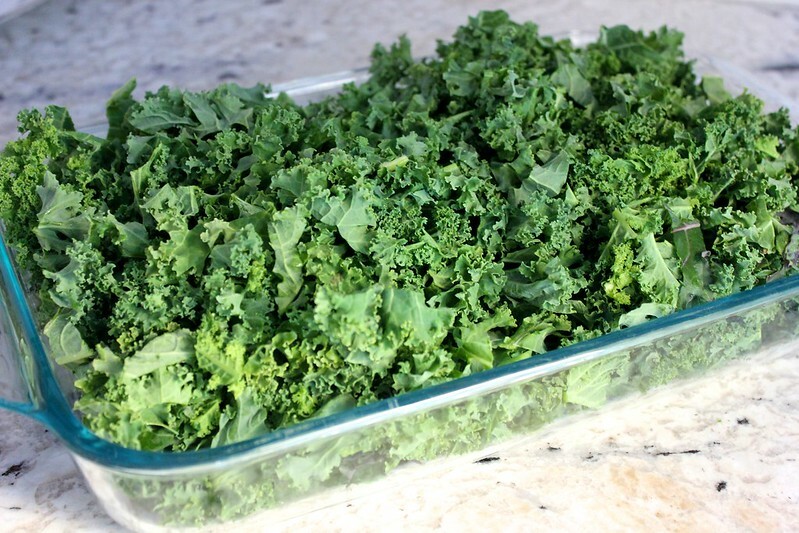 Wash the kale, remove the stems, and then slice the leaves into thin shreds. You’ll need about 4 packed cups of shredded kale. Small dice 1 small onion or 2 shallots. 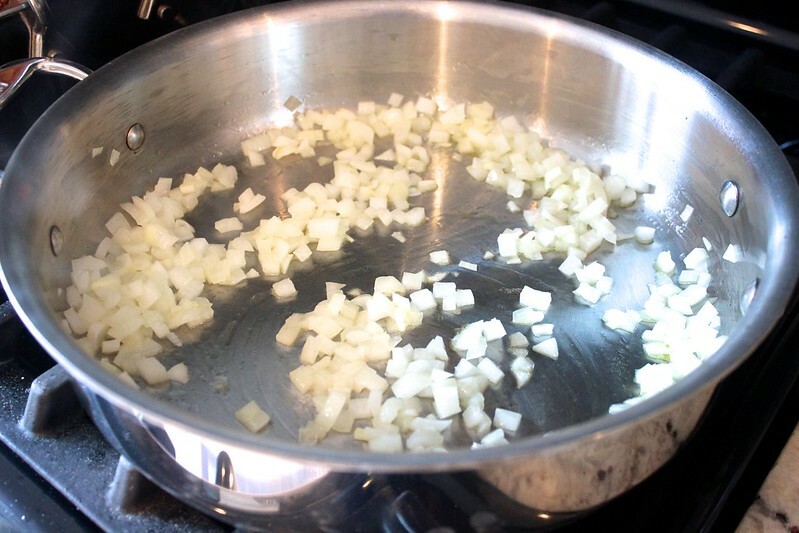 Then, sweat them with some olive oil in a large, oven-proof sauté pan. Once softened, add the kale and a splash of white wine. To help the kale wilt, cover your pan, and toss the greens occasionally. Season the kale lightly with salt and pepper. 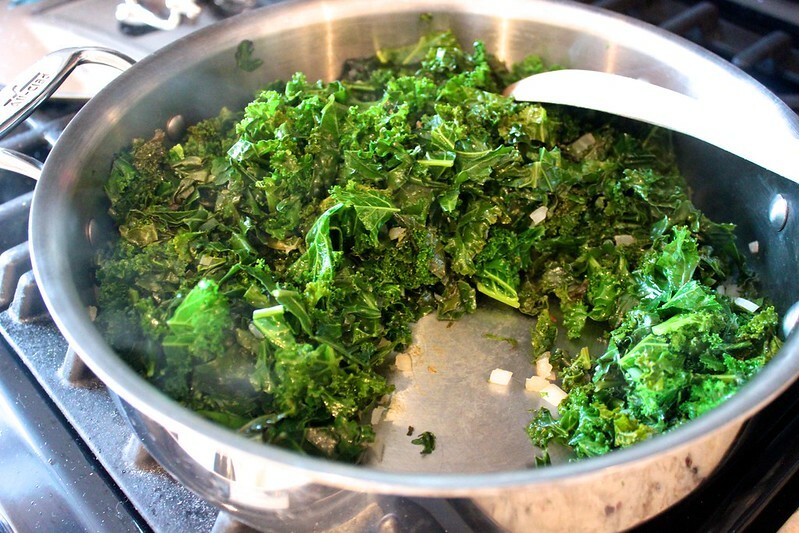 Once wilted, transfer the kale and onion to a side bowl. 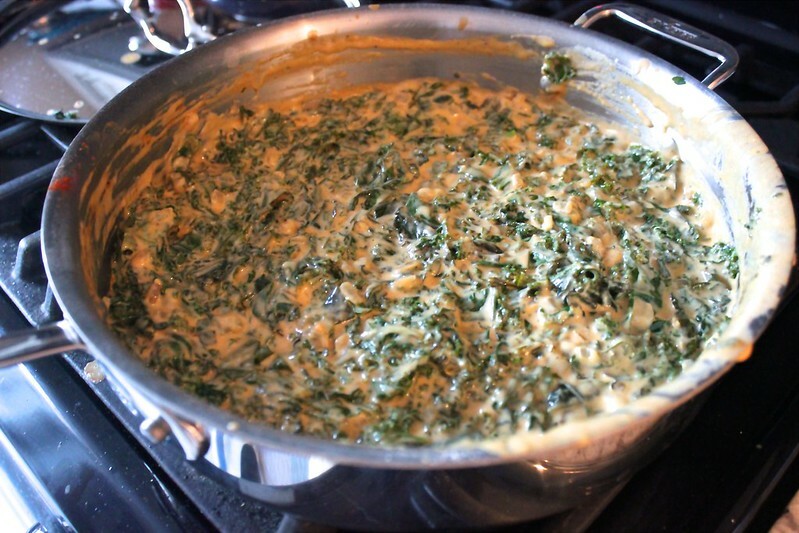 While the kale wilts, grate 2 cups of a melty cheese- gruyere and/or cheddar are good. Also grate 1/2 cup of parmesan cheese. In the empty pan, melt 2 tablespoons of butter. 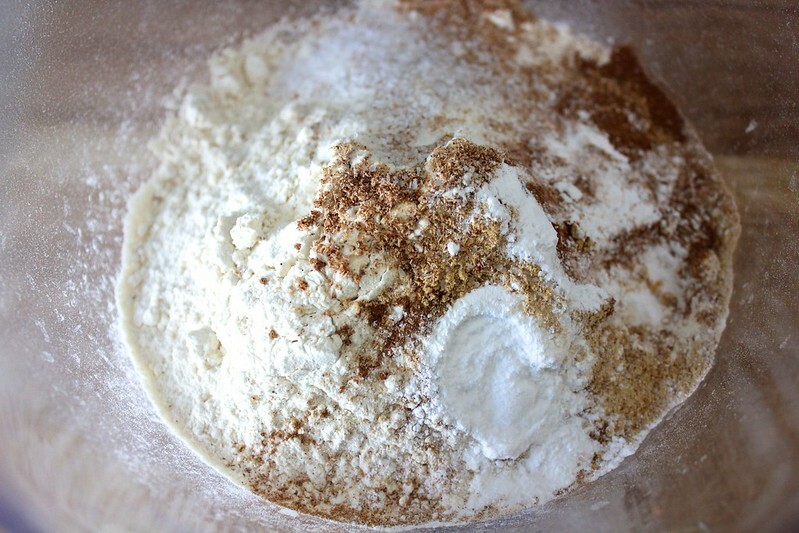 Then, whisk in 1.5 tablespoons of flour. 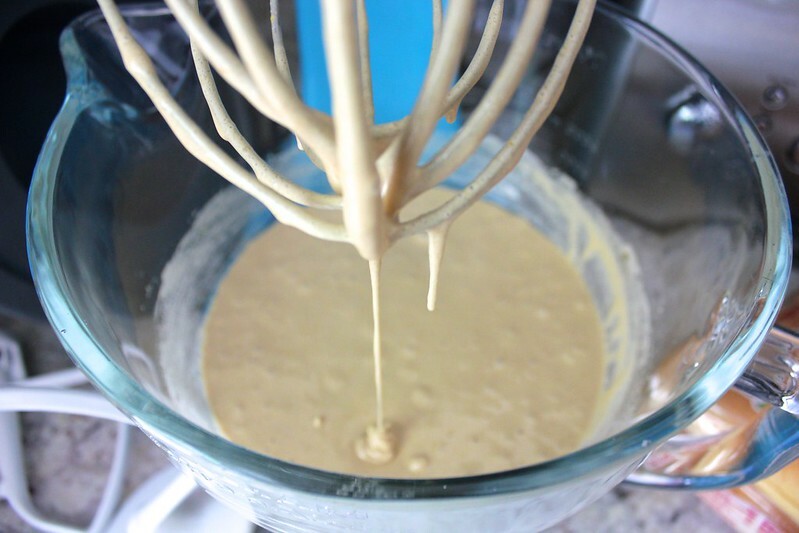 Continue whisking until they form a paste. You can add a few more sprinkles of flour if needed. Also whisk in 1 tablespoon of smoked paprika, 2 teaspoons of garlic powder, 1/4 teaspoon of cayenne pepper, and 1/4 teaspoon of black pepper. Very slowly whisk in 2 cups of whole milk. 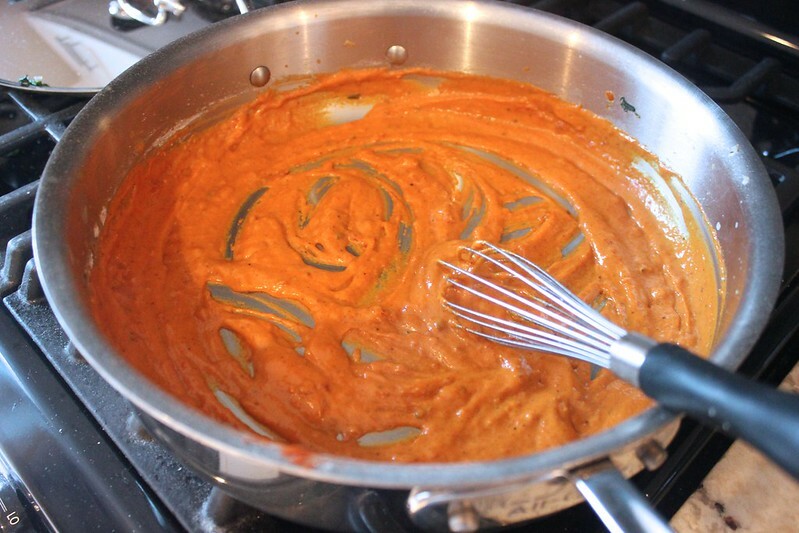 When you add the first splash of milk and whisk it in, the paste will thicken. 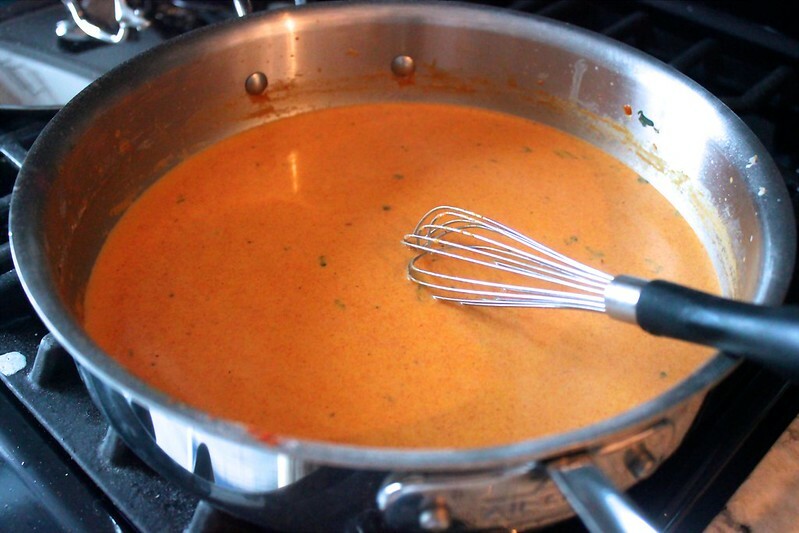 Continue this process, allowing the milk to fully incorporate each time, and you’ll eventually get an even sauce. Heat the sauce, stirring almost constantly, until it steams and begins to thicken. 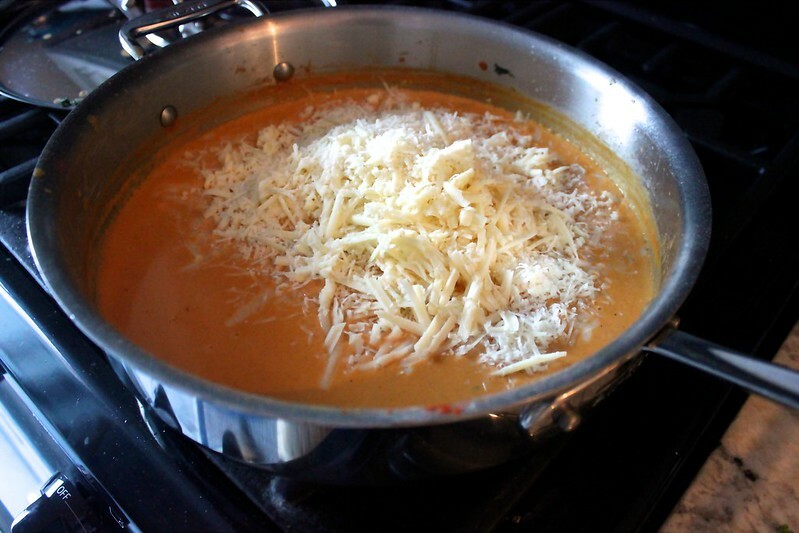 Remove the sauce from the heat, and add in most of the cheese, but reserve a few handfuls of the cheese for a topping. 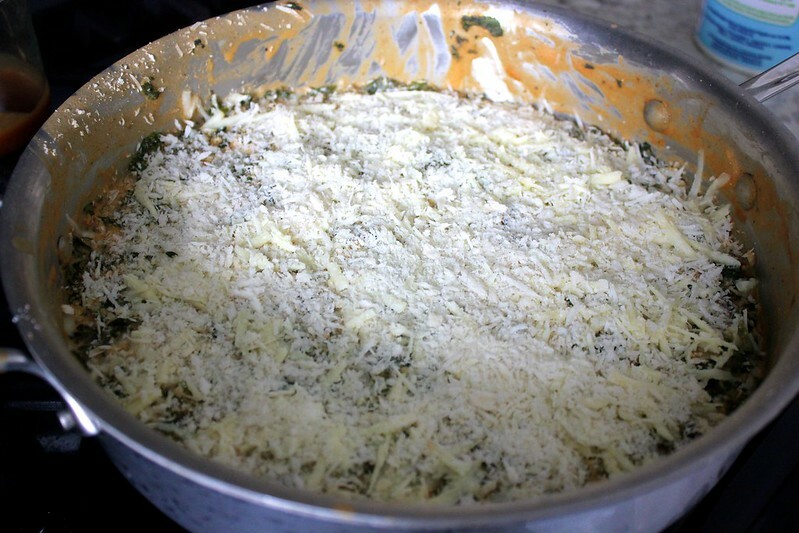 Preheat your oven to 325° F.
Once the cheese has melted, stir in the kale and onions. Taste, and season with salt as needed. Top the kale with the remaining cheese and 1/4 cup of panko breadcrumbs for extra crispness. 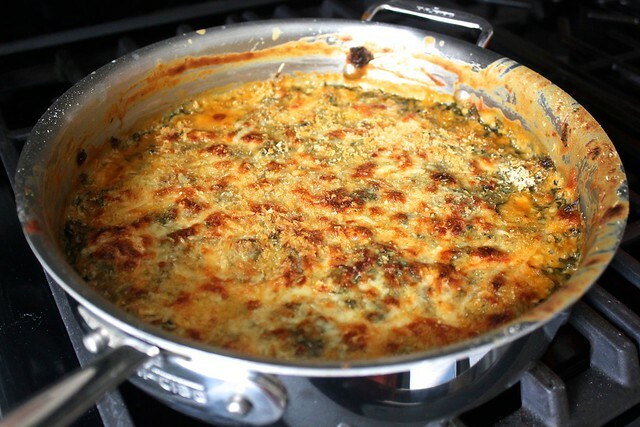 Bake the gratin for 20-30 minutes, just until the edges of the gratin bubble and the cheese topping begins to brown. To maximize your crust without overcooking the kale, put the gratin under the broiler. Serve the gratin in the skillet, doling out small scoops of decadence to all you love. 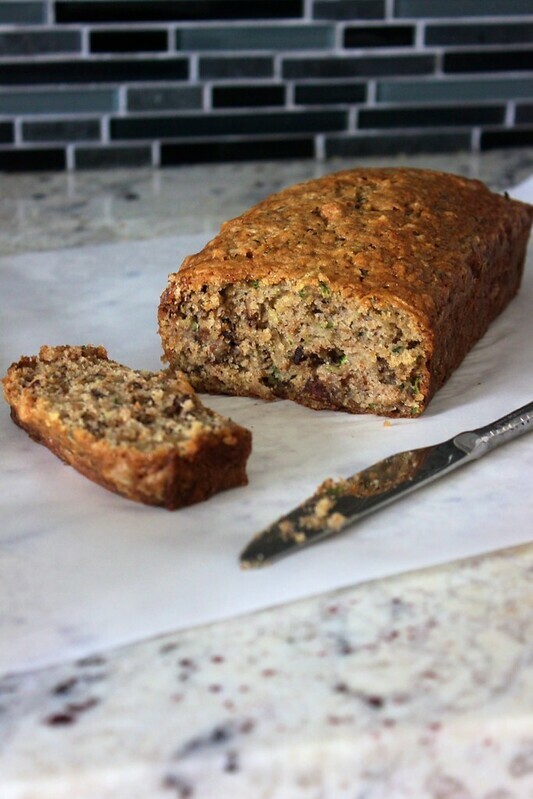 I have been making this zucchini bread regularly for years, and it’s really not fair that I haven’t let you in on this recipe until now. It’s the perfect thing to make when the farmers markets are overrun by zucchini, or when you find that rogue, overgrown squash in the back of your garden (not a problem I’ve ever been lucky enough to have). This bread is just sweet enough to work as a satisfying dessert, but it’s packed with enough healthy ingredients to pass for breakfast (a pleasure I frequently enjoy). 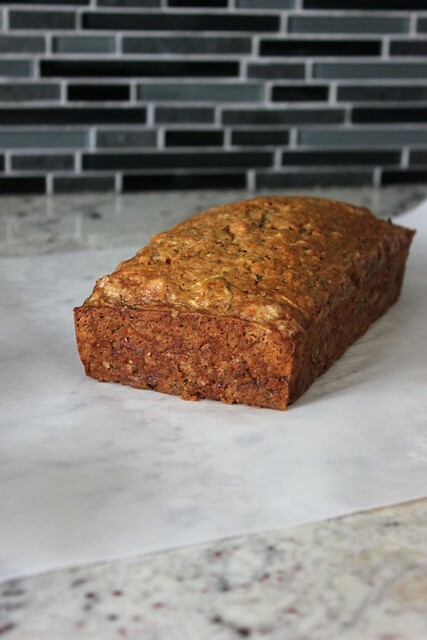 Flecked with bright green zucchini, studded with toasty walnuts, sprinkled with flax seeds, and fortified with whole wheat flour- you must embrace this delicious loaf! Even better, this recipe makes two loaves. Keep one for yourself, and give the other to someone you really like. To make the zucchini bread, heat your oven to 325° F. Spread 1.5 cups of chopped walnuts on a baking sheet, and put them in the oven to toast. Meanwhile, grate 2 cups of zucchini on the large holes of a box grater. 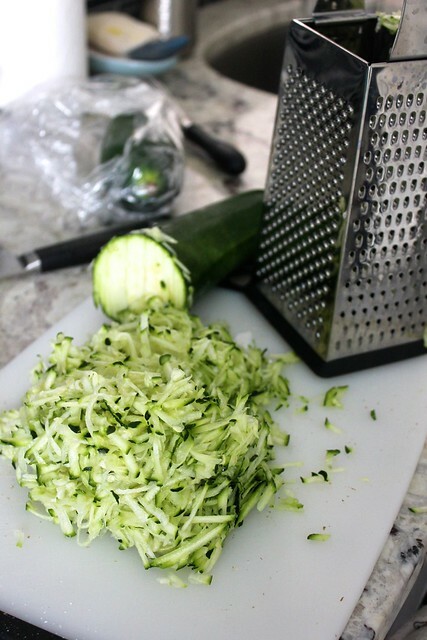 Grating zucchini is effortless and satisfying. 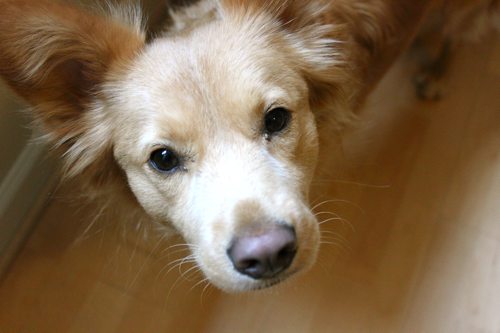 Here’s my Nara girl. 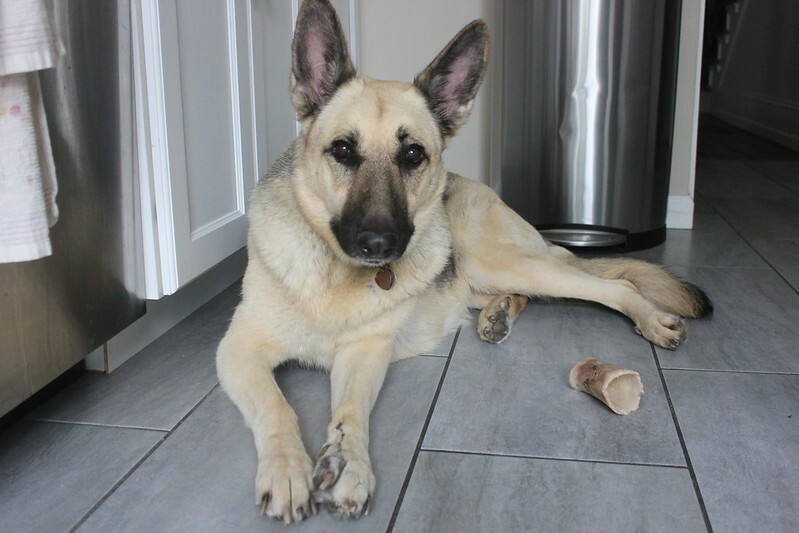 She’s always in my foot space when I’m working in the kitchen. In a large bowl, beat together 3 eggs and 1 cup of vegetable oil. Once combined, whisk in 1.5 cups of sugar and 1 teaspoon of vanilla extract. In a separate bowl, whisk together 1.5 cups of white flour, 1 cup of whole wheat flour, 2 tablespoons of ground flaxseeds, 1/2 teaspoon of salt, 3/4 teaspoon of nutmeg, 1 teaspoon of baking soda, and 1/2 teaspoon of baking powder. Stir the dry ingredients into the wet ingredients. 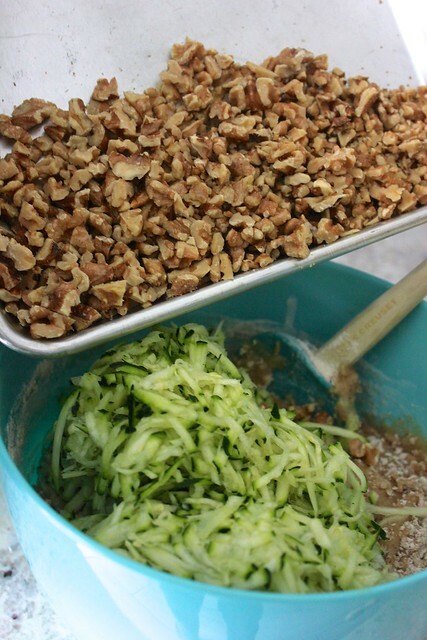 Then, fold in the grated zucchini (squeezing out excess liquid, but you don’t have to be exhaustive about it) and toasted nuts. 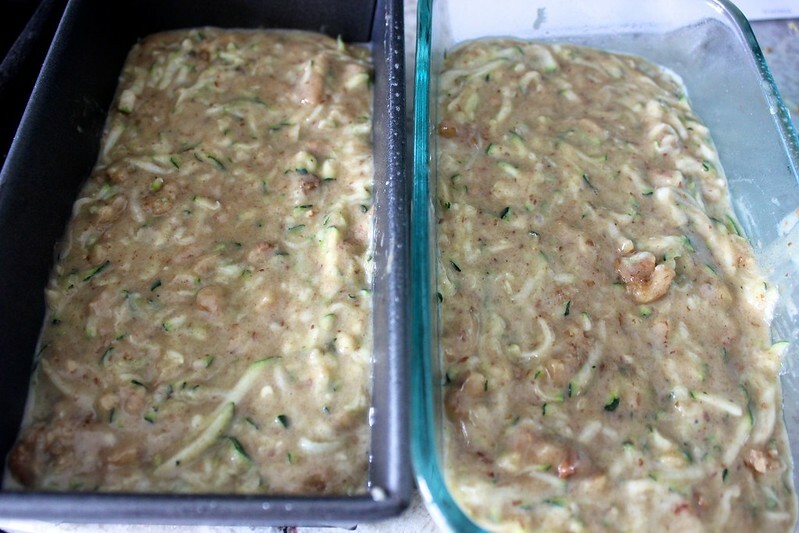 Grease 2 loaf pans, and divide the zucchini batter between them. 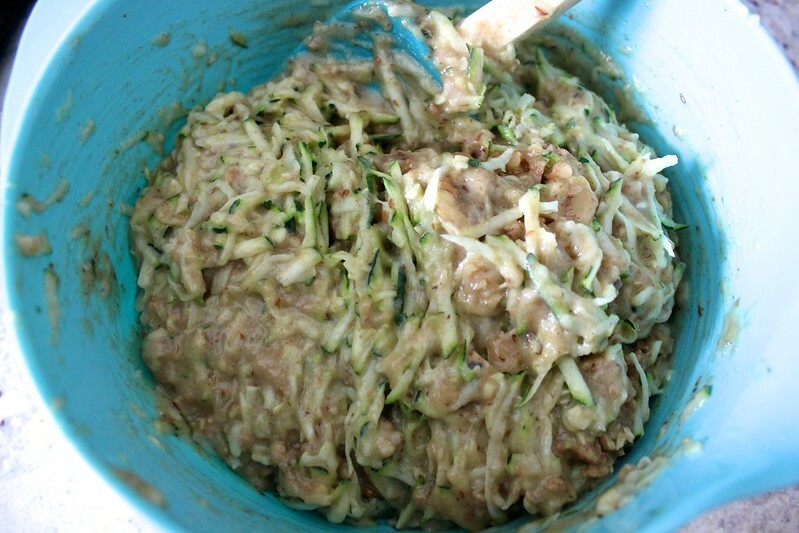 Bake the zucchini breads for approximately 60 minutes, until a toothpick inserted into the center of each loaf comes out clean. Loaves in metal pans tend to finish cooking about 5 minutes before loaves in glass pans, so keep an eye on them if you’re using both, like I do. 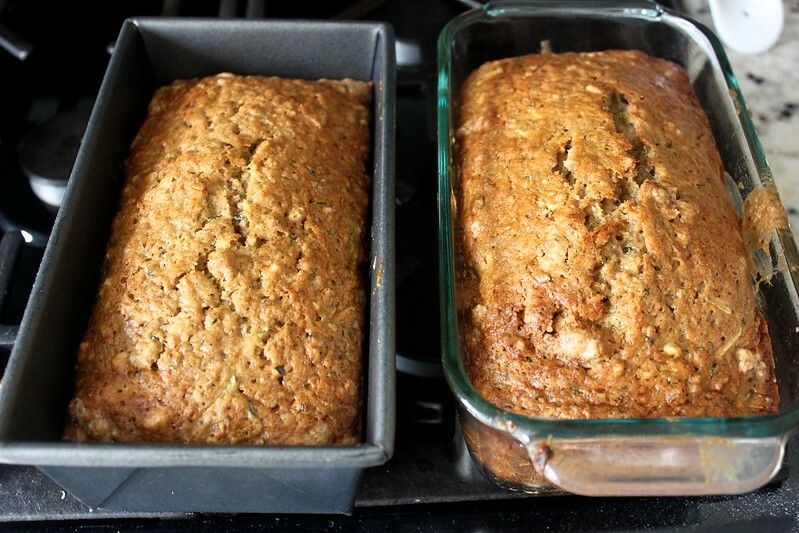 Let the zucchini breads cool, in or out of their loaf pans. Then slice and serve. You’ll love your next breakfast! 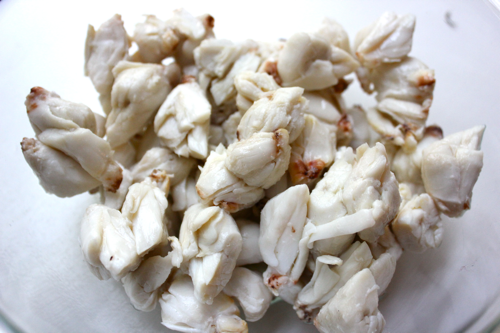 This recipe is adapted from Bob’s Red Mill. For quite a while, I spent a lot of time on Amtrak commuting between Philly and DC. I spent those luxurious hours listening to podcasts and reading cooking magazines. 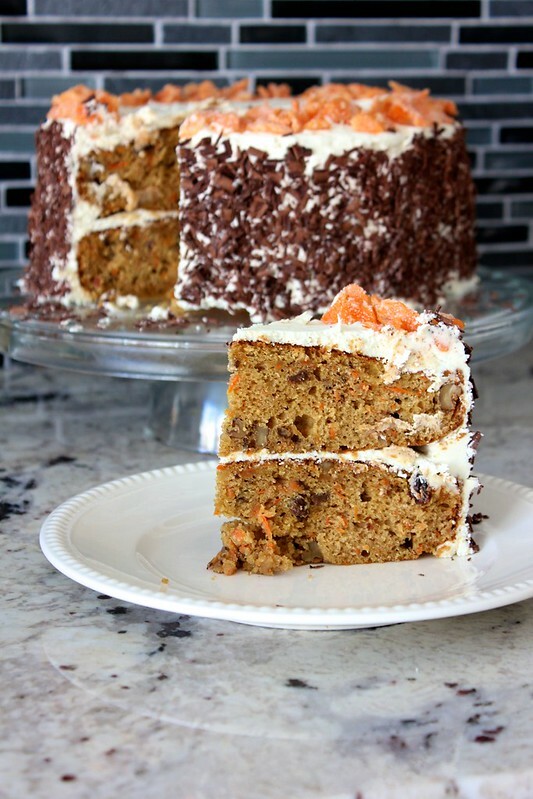 When I came upon a recipe for the “best carrot cake,” I dogeared the page and resolved to bake the cake for father’s day. 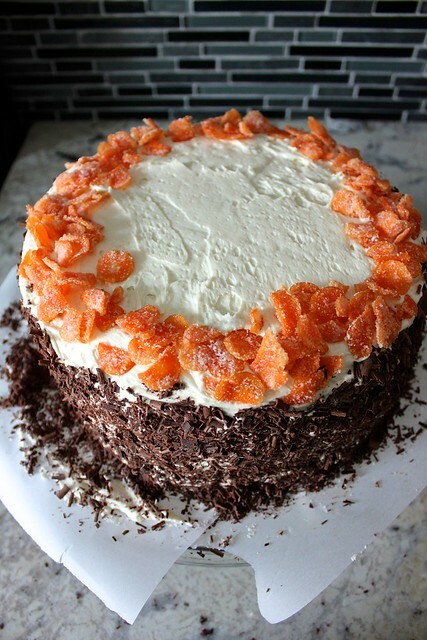 My dad loves this one particular carrot cake from a diner in Philadelphia, with shaved chocolate around the outside, cream cheese icing, and cute orange carrots made of frosting decorating the top. I think we’ve had this cake my whole life, brought by family members to every gathering. On the few occasions when the diner only had cakes with walnuts around the outside, sadness ensued. And so I, not the best baker but one who shows love with food, successfully made a carrot cake better than the one from the diner. We’ll never be tormented with walnuts on the outside of a cake again. Walnuts inside of the cake, however, are completely acceptable, even desired. 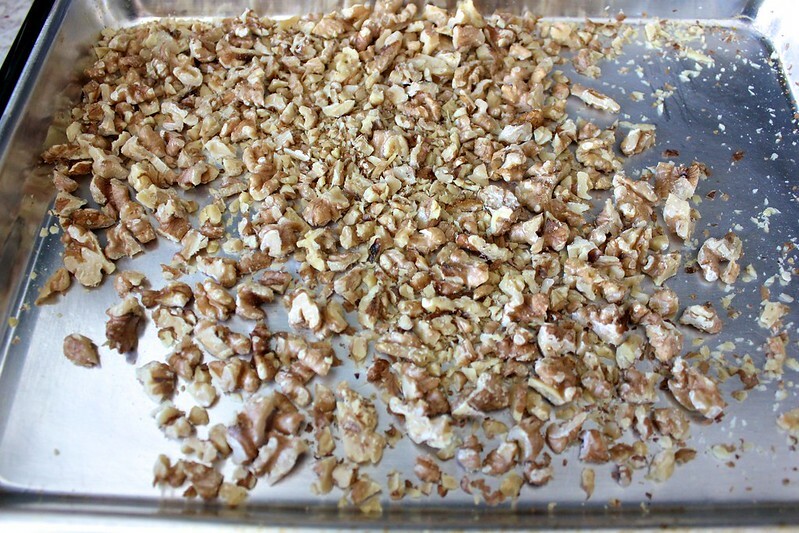 So to make this cake, begin by toasting 1 cup of chopped walnuts in the oven until they smell toasty, then set them aside. 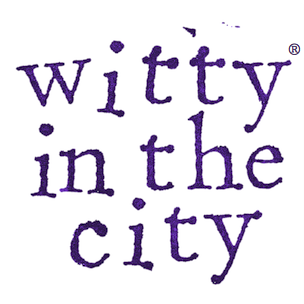 While the walnuts toast, add 1/2 cup of raisins and 3 tablespoons of rum to a small pot, heat it until warm, then turn off the heat and let the pot sit for about 20 minutes until the raisins plump and absorb the rum. 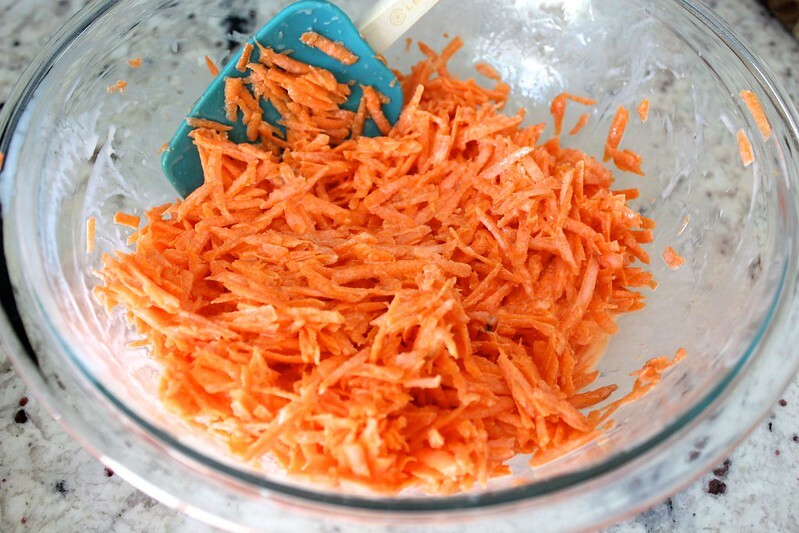 Peel 1 pound of carrots, and grate them using the large holes of a box grater. Add the carrots to a bowl, and stir in 1 cup of buttermilk. In a large bowl, whisk together 2.5 cups of flour, 2 teaspoons of cinnamon, 2 teaspoons of ground ginger, 1/2 teaspoon of nutmeg, 1.5 teaspoons of kosher salt, 2 teaspoons of baking powder, and 3/4 teaspoon of baking soda. 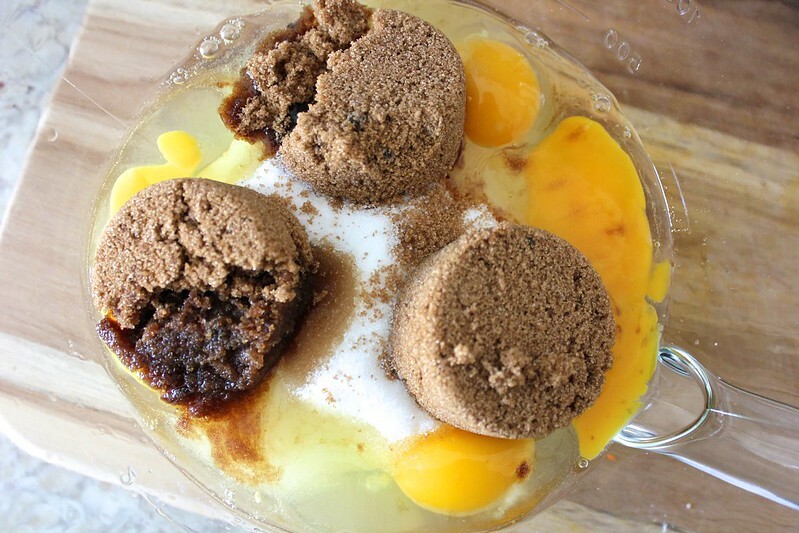 To the bowl of a stand mixer, add 4 eggs, 1 cup of sugar, 3/4 cup of brown sugar, and 2 teaspoons of vanilla extract. 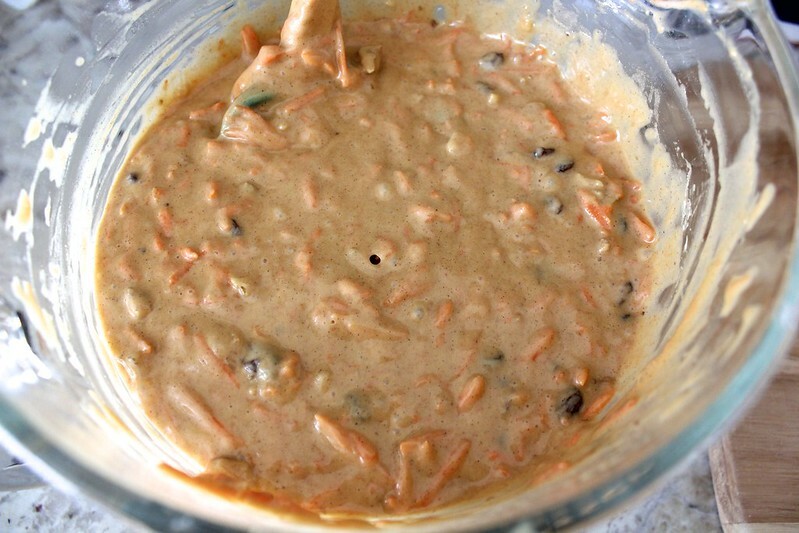 Use a mixer to beat the wet ingredients for about 4 minutes, until the mixture is pale and thick. Reduce the mixer speed, and slowly pour in 3/4 cup of vegetable oil. Stir in 1/3 of the dry ingredients, then stir in 1/2 of the carrots, and repeat until the dry ingredients and carrots are all mixed in. Then, stir in the raisins and walnuts. Heat your oven to 350º F. Grease two 9-inch cake pans, and line the bottoms with rounds of parchment paper. Grease the tops of the parchment paper, and then divide the batter between the pans. Bake the cakes for 35-45 minutes, until a toothpick can be inserted into the center of a cake and come out cleanly. 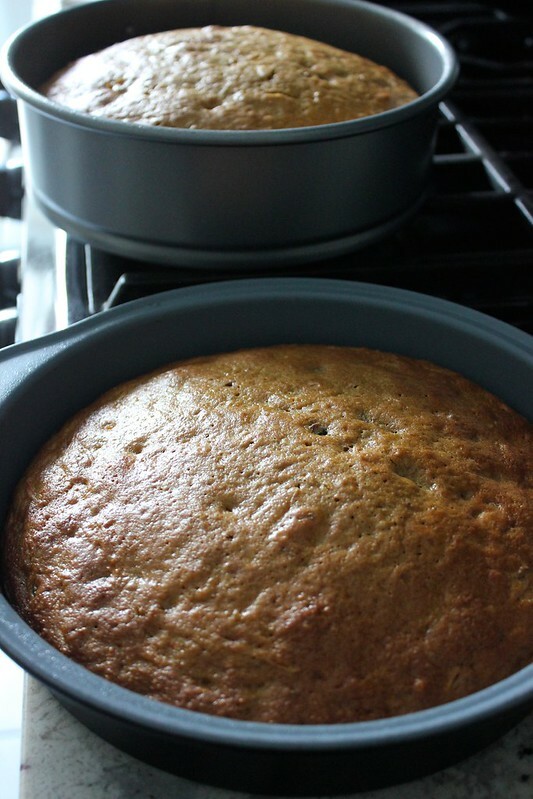 Let the cakes rest, then remove them from the pans and let them cool on a rack. While the cakes bake and cool, prepare the cake decorations. Bring 1 brick of cream cheese and 1.5 sticks of butter to room temperature. 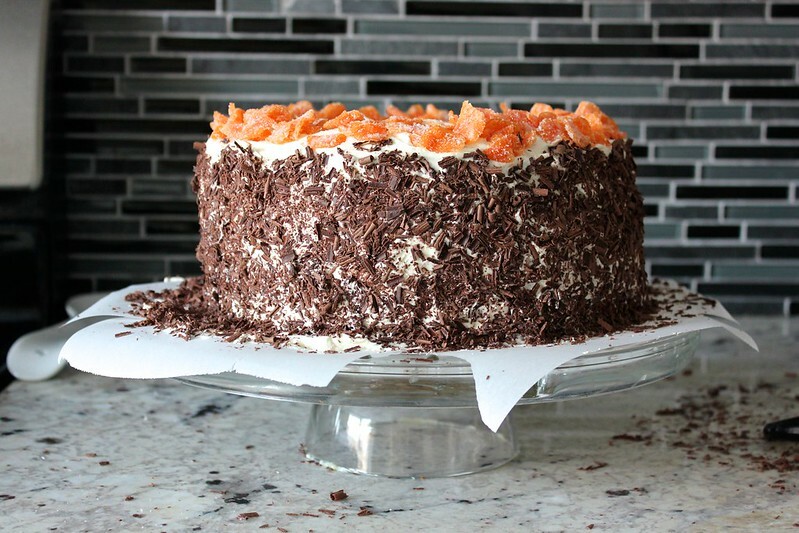 If you want to make candied carrots for the top of the cake (not very delicious, but very pretty), slice 2 carrots thinly into coins using a mandoline. 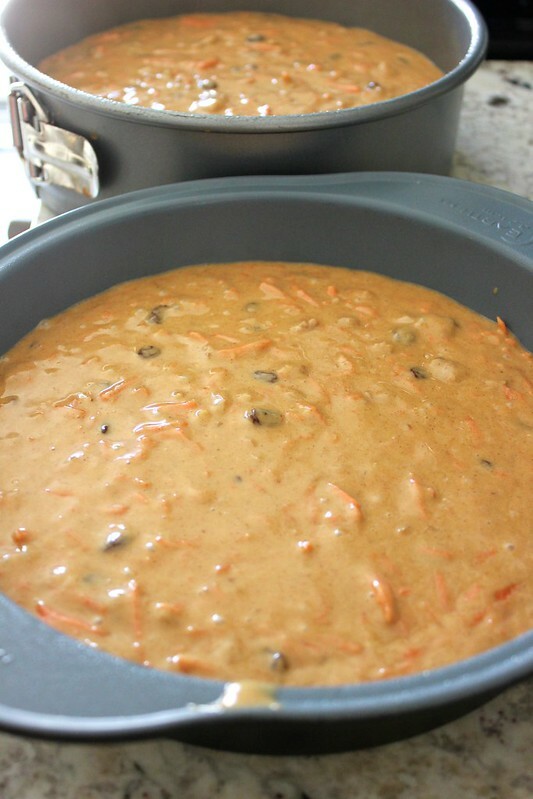 Add the carrots to a small pot along with 2 tablespoons of sugar and 1/4 cup of water. Heat the pot, and stir to dissolve the sugar and separate the carrots. Then increase the heat to high and cook until the liquid thickens into a syrup. Stir in a bunch of pinches of sugar until the carrots are coated. 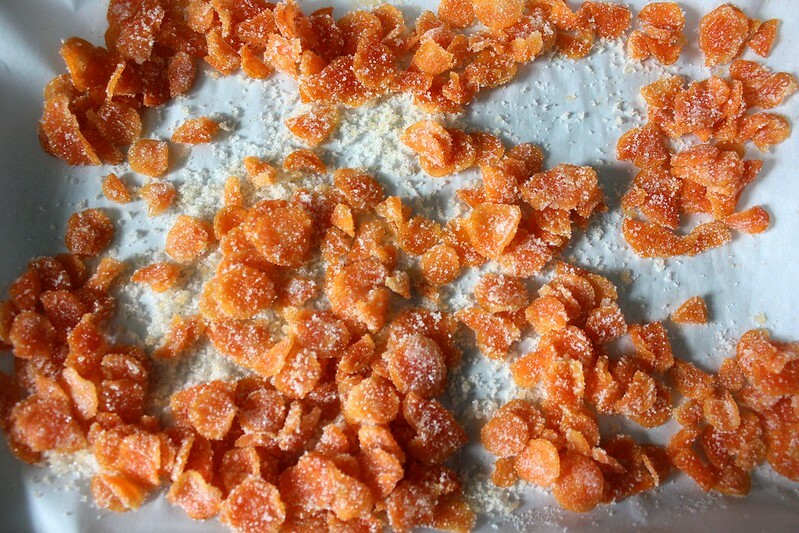 Dump the carrots onto a tray with even more sugar, and toss them to coat. 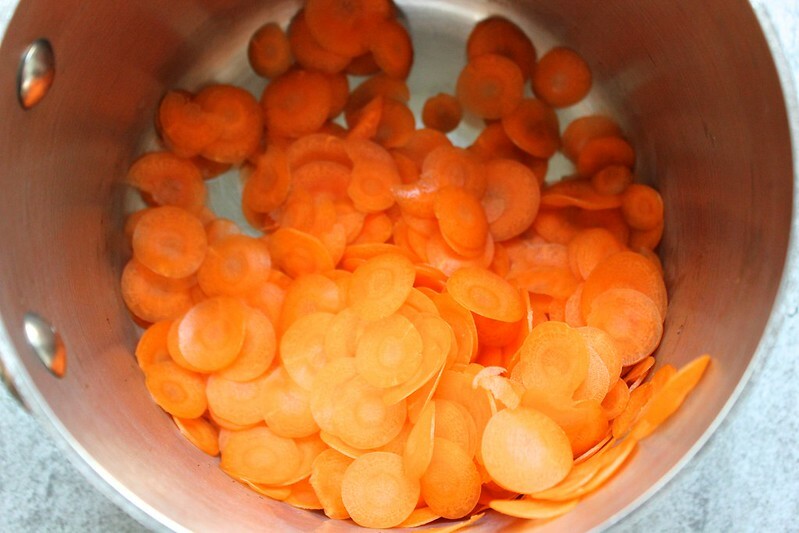 Separate the carrot coins, and allow them to dry off and harden in the sugar. Add sugar liberally as needed. Also make the cream cheese frosting! MY FAVORITE PART. Using a mixer, beat 1 brick of room temperature cream cheese with 1.5 sticks (3/4 cup) of room temperature butter. Once smooth, beat in 1 teaspoon of vanilla extract and a pinch of salt. Turn the mixer to low, and gradually add 4 cups of powdered sugar. Once incorporated, return the mixer to high, and beat the frosting for 2 minutes until it is fluffy. When the cakes are completely cool, place one of the cakes upside down on a cake plate. Top with 3/4 cup of frosting, followed by the other upside down cake, and 1.25 cups of the frosting. 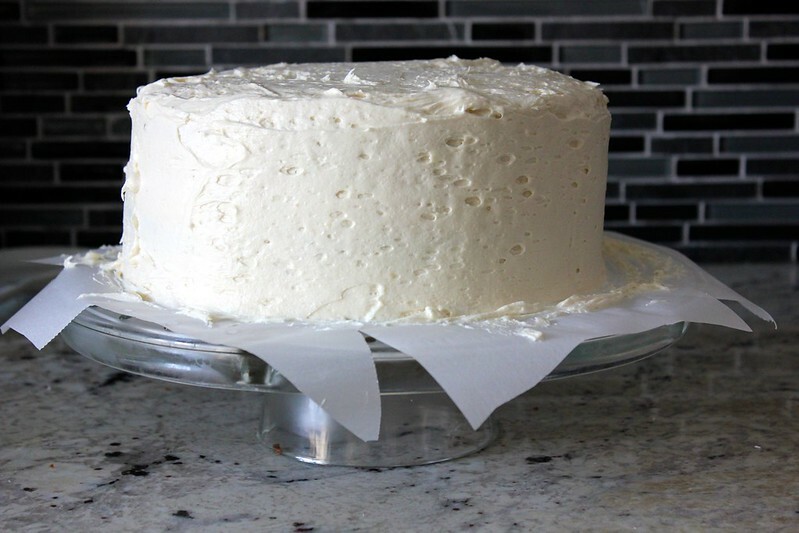 Put some pieces of parchment paper around the bottom cake to keep your cake plate clean during decorating. 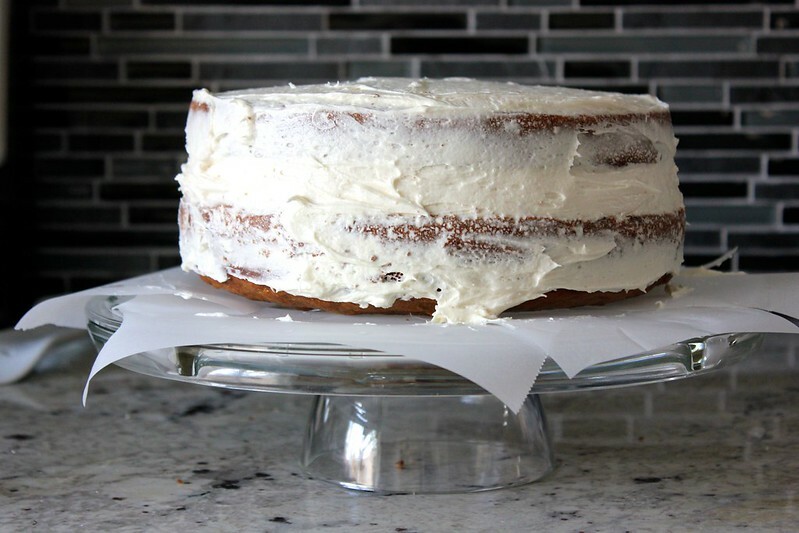 Use an offset spatula to spread the frosting over the top and sides of the cake. Put the cake in the refrigerator for 30 minutes. Then, add the rest of the frosting to the top of the cake, and spread it over the top and around the sides of the cake. 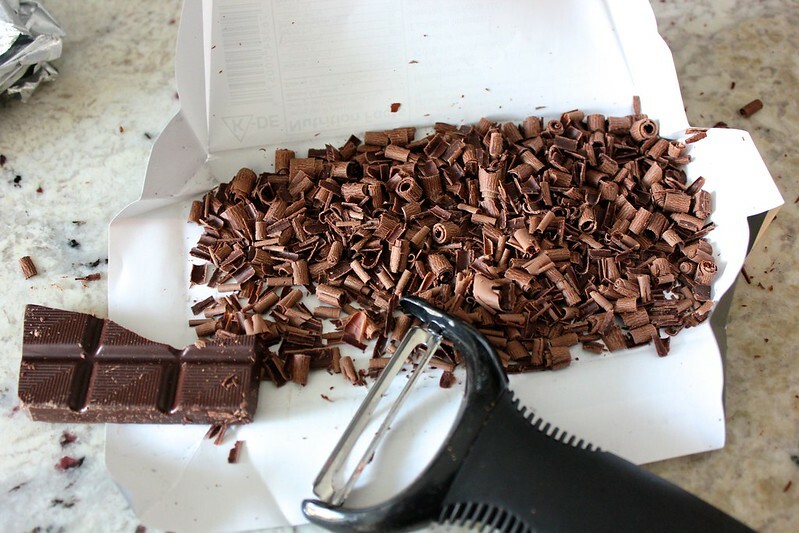 Use a vegetable peeler to turn a bar of dark chocolate into a whole lot of chocolate shavings. Gently press the chocolate shavings into the sides of the cake. Arrange the candied carrot coins on the top of the cake. 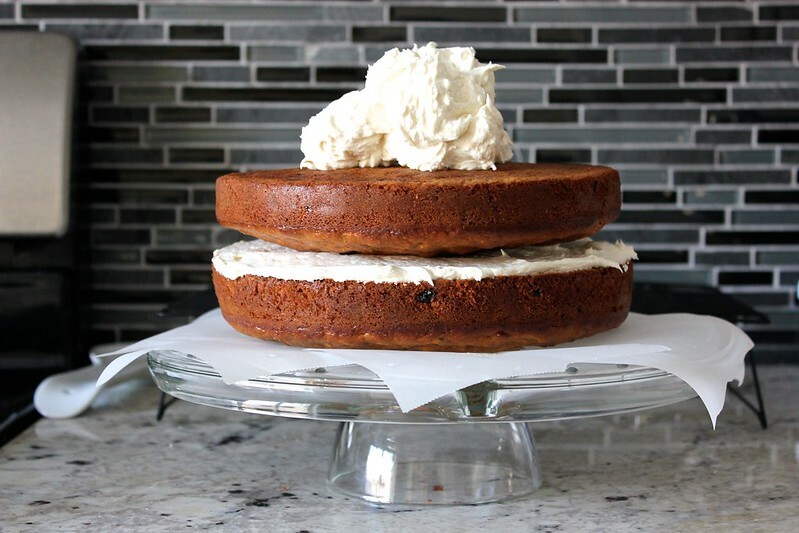 Remove the parchment paper, and behold the carrot cake beauty! 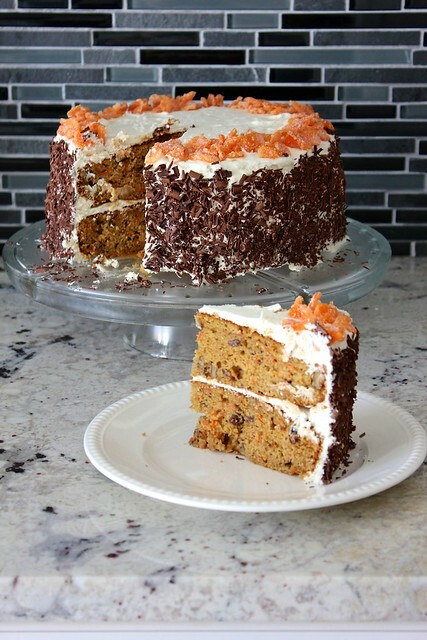 Slice into that carrot cake and admire the layers flecked with orange carrots, plump raisins, and toasted walnuts. It’s moist, not too sweet, and the cream cheese frosting binds it all together in a tangy-sweet hug. But the best part, of course, is the chocolate shavings! My dad loved his cake, and I loved making it for him. Everyone liked eating it a whole lot too! Between servings, store the cake covered in the refrigerator. No doubt, this cake will be a father’s day tradition. The diner version will have to suffice the rest of the year! This recipe is from Bon Appetit magazine.